Vendetta Plus Cockroach Gel Bait combines two modes of action in one tube. In addition to an effective cockroach bait Vendetta Plus also contains the insect growth regulator (IGR) NyGuard which interrupts the life cycle of the roach and helps to prevent future infestations. The IGR stops reproductive potential of cockroaches exposed to a non-lethal dose or populations resistant to other actives resulting in death or sterility of the population. This product is effective against both non-averse and averse populations of German cockroaches. 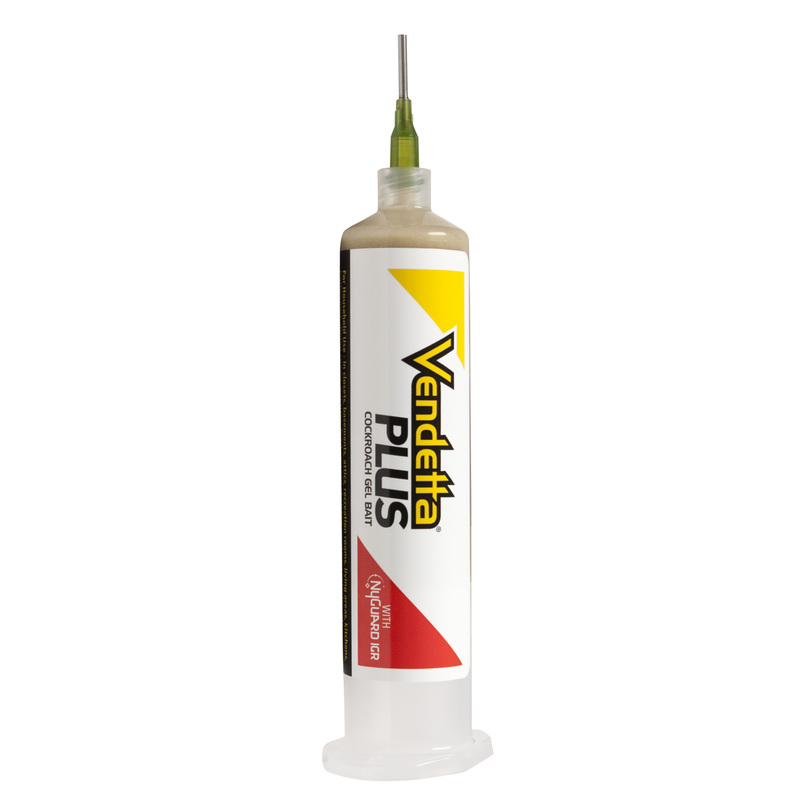 Vendetta Plus is a good choice for control in environments that are tough to control and against heavy infestations killing cockroaches where they hide. Vendetta Plus does not contain any of the Big 8 food allergens (tree nuts, fish, shellfish, cow milk, peanuts, wheat, soy, or eggs), but is highly palatable to roaches. The innovative bait matrix does not get runny in high heat and stays attractive to roaches for months after placement. See our Cockroach Bait Gel Placement Guide for tips on application. We provide 1 Plunger PER ORDER to expel the bait from the tubes. You can purchase extra plungers or you can purchase a bait gun for use with this product. We recommend the Masterline Professional Bait Gun. Vendetta Plus bait gel is unique in that it combines an active adulticide, Abamectin, with the insect growth regulator (IGR) NyGuard (the active ingredient Pyriproxyfen). When a roach consumes Vendetta Plus bait, the Abamectin interferes with the insect’s nerve impulses as a GABA inhibitor and begins affecting cockroach populations within 24 hours. The insecticide works slowly enough to allow roaches to return to harborage sites and transfer the active ingredient throughout the colony directly through contact, or indirectly through feeding on feces or poisoned carcasses. The IGR serves as both a bonus and a backup: roaches that may not consume a lethal dose of Abamectin cannot reproduce, and immature stages of roaches do not develop into adults. This combination of ingredients results in faster control by breaking the breeding cycle and transferring throughout the population. Vendetta Plus Cockroach Bait Gel may be used for a variety of roach infestation, though it is especially designed for difficult or more advanced infestations of German roaches. The bait matrix is more tolerable in high heat than other formulations, and it will remain effective long after application. With the addition of NyGuard IGR, Vendetta Plus works harder at eradicating the entire population by interrupting the breeding cycle. Vendetta Plus is an excellent choice when an IGR is needed but other formulations, such as spray, are prohibited or otherwise undesirable. Vendetta Plus can still be used in sensitive areas such as schools and food-handling establishments. Use Vendetta Plus as part of an Integrated Pest Management (IPM) program. Rotation of Vendetta Plus with other cockroach baits is recommended over the course of the year to delay the development of additional forms of behavioral resistance. Additionally, application of an insect growth regulator such as NyGuard IGR is an excellent supplemental treatment option. 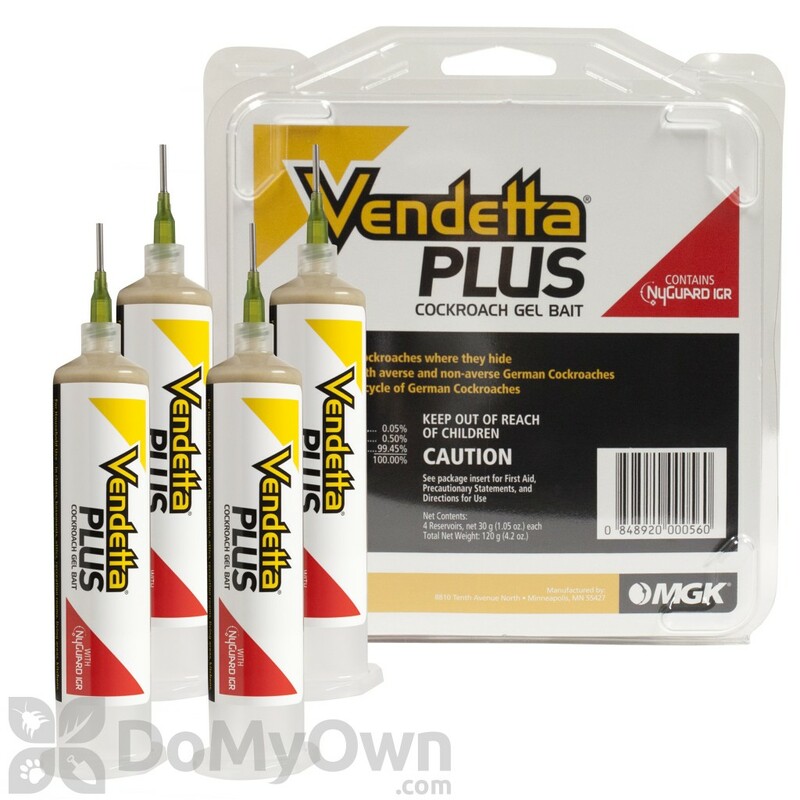 Apply Vendetta Plus Cockroach Bait Gel as a spot or crack and crevice treatment where roach activity has been found. The pre-filled plastic reservoir containing Vendetta Plus is intended for use with bait injector application devices common to the pest control industry. Inject into cracks and crevices, void spaces, and other locations where insects may harbor, live and breed. Concentrate the bait placements as individual spots at insect activity sites (only in areas inaccessible to children and pets). Re-apply as needed. Remove the cap from the nozzle, touch the top to the surface to be treated, and push down on the plunger. Apply bait as spots in cracks and crevices. Recap the dispenser after treatment is completed. Do not apply gel to areas that have been recently sprayed with insecticide, and do not spray insecticide over gel, as this may cause the bait to become repellent. The bait will adhere to non-greasy or non-dusty surfaces and will remain pliable and palatable to German Cockroaches as long as it is visibly present. A visual inspection of bait placements is recommended at one month after the initial treatment. Reapply when bait is no longer visibly present, according to the level of infestation. Replace bait before it is completely consumed to keep German Cockroaches from returning. * Multiple small placements are more effective than fewer, larger placements. Bait Points should be 3 - 6mm (1/8 - 1/4 in.) in diameter to equal 0.25 to 0.50 g.
For best results, focus bait placements in or near cracks and crevices and near roach harborages. See our Indoor Roach Control Guide for images and more details. Applications should focus on cracks and crevices in areas where activity has been observed or is likely, such as near water sources, around pipe collars, where utilities enter, around or under appliances, underneath counters, where cupboard frames meet the wall, along drawer slides, along baseboards, doorframes, and windowsills. If using residual sprays, do not use sprays and baits in the same places: keep sprays in low areas on or near the floor and use baits in higher locations. Applications in Aircraft: Do not apply any bait in cockpit area. Application within passenger areas of aircraft is limited to Crack & Crevice treatment only. Apply Vendetta in areas between elements of construction (such as areas under sinks, openings around pipes, under shelving, where shelving meets other shelves or the wall, areas between and around microwaves, where support braces attach to the main structure and where seats are attached to the floor). Use 12 to 24 bait placements per 100 sq. ft. Avoid depositing gel on exposed surfaces. Inspect bait placements and re-apply as needed. Vendetta Plus is Not Intended for Outdoor Use. Roach bait gel includes NyGuard IGR (Insect Growth Regulator). Reduces the population by preventing reproduction. Shelf life of 3 years or more when stored at room temperature. Effective even for bait-averse German Roaches. Labeled for food and non-food areas of food-handling establishments. Bait matrix does not contain any Big 8 food allergens and does not get runny in high heat. Safe to use in sensitive areas; less invasive and more effective than sprays alone. To areas that have been recently sprayed with insecticide to prevent the bait from becoming repellent – cross-contamination of the bait can negatively impact its palatability. To greasy or dusty surfaces – the bait will not adhere as well as it will to clean surfaces. In locations that are routinely washed – the bait will be removed by washing. In locations where routine-cleaning operations may transfer diluted bait to food or food preparation surfaces. In or on electrical equipment where a possibility of shock hazard exists. Do not apply to humans, animals, clothing, or bedding. Do not contaminate feed or food products, or food preparation surfaces, dishes, kitchen utensils or food containers. Avoid placing gel on fabrics, carpets, clothing, or textiles since it may stain some absorbent materials. Sanitation should always be the top priority when treating for roaches! Read more about how to get rid of roaches. I own a pest control company and have used just about every liquid bait on the market. Vendetta is the best I've found. It won't get runny in a hot truck and it always works in my German roach clean-outs. It's cheaper than Advion too, great bait! THIS PRODUCT is Excellent I like it very much? I will Refer-A-Friend about this product. I'm not a professional. I had a German Roach problem(as I call them nazi's, mainly because they wouldn't die) in 2010 someone brought them into my home. I tried all over the counter products. Nothing worked! I tried an exterminator & i couldnt afford the $120 a month till they got themu der control. They got so bad I was ready to move out & let the nazi's have the house. Then I found this website, I bought the kit recommended. It contained Demon WP that you mix in sprayer, I had already been using it but it wasn't enough. The other item in the kit was vendetta plus. I went through the 4 tubes wasn't enough for the square footage of my house so I bought 4 more 2 weeks later. In a month, the nazi's were gone. That was in 2012 or 2013 & haven't seen another nazi german roach since. I highly recommend this product to every one esp. when I hear them say they have a german roach problem. Very effective alternative to fogging! We had those terrible German cockroaches, which seem to be everywhere in our town right now, and we had been trying a little bit of everything. We liked the idea of using the gel bait so that we could avoid covering everything in our house with a fine layer of poison. We laid the gel down generously, probably more generously than directed, but the roaches were gone within a week, and we haven't seen any in a few weeks. We have a small apartment (500-600 sq ft), and one tube was plenty. The package comes with 2 syringes and one plunger. We saved the plunger and one of the syringes in case we need to lay the gel down again. If you want to apply more than one tube at once or do multiple applications, you may need to order extra plungers/syringes. Is the Vendetta Plus safe around cats and dogs? 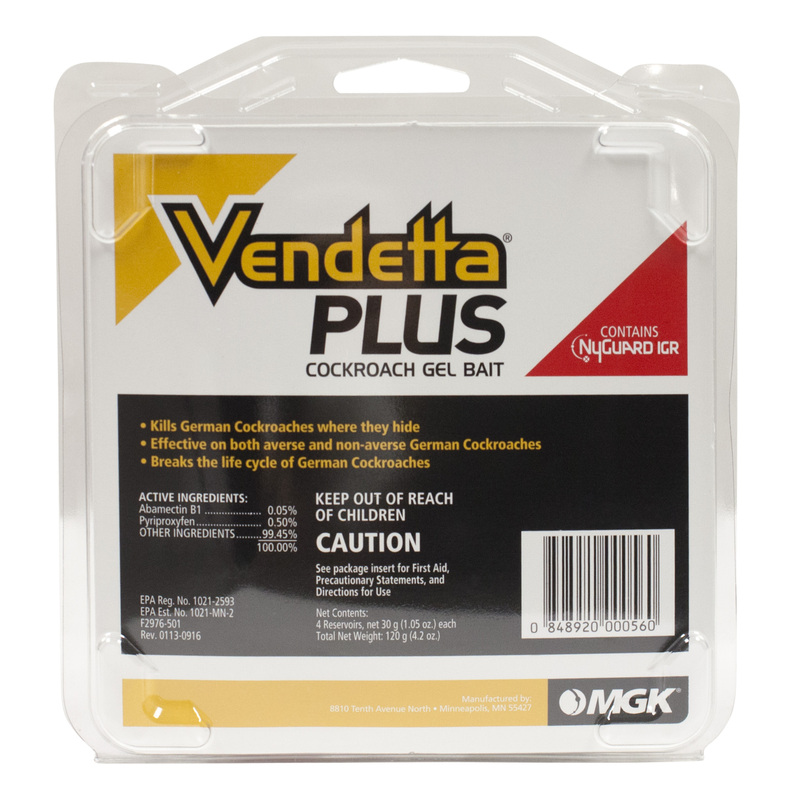 Vendetta Plus Cockroach Bait Gel is pet safe as long as it is kept out of reach of pets, like cracks and crevices, inside cabinets and drawers, and back behind and underneath appliances. Mammals have a much higher toxicity threshrold and would need to consume a good amount, around 30 grams of bait for it to have much of an effect, besides maybe an upset stomach. There is a very small amount of active ingredients in insect baits that make it difficult for poisoning to occur. However, if poisoning is suspected please contact your veternarian for consultation. Does it Vendetta Plus work with all roaches - or only German roaches? The Vendetta Plus Cockroach Gel Bait works on all roaches, including the hard to kill German Roach. Can I mix Suspend and Cyper WP together for roaches? There would really be no need to mix both Suspend and Cyper Wp. You can apply one or the other as a barrier to cracks and crevices and around the outside foundation. These insecticides will just kill the roaches that come incontact with it. 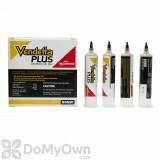 You also want to use Vendetta Plus bait which they will take back to where ever they are hiding out. Will cockroaches still eat Vendetta Plus Cockroach Gel Bait if it dries out and hardens? We recommend replacing the Vendetta Plus Cockroach Bait gel and any other roach bait gel every 2-3 weeks or as needed for best results. If the bait has dried out or hardened, it is not as appealing for roaches to feed. About how many Vendetta Plus Cockroach Gel Bait tubes do I need for a duplex house? Each tube of Vendetta Plus Cockroach Gel Bait has about 30 grams or 30 dabs of treatment in them. One box of 3 tubes should be plenty to start out with.